An idyllic holiday destination Calabria offers you countless things to do and explore in the southernmost region of the mainland, from insider hot spots to classic must-see sights and panoramic landscape. If you are looking to explore the real beauty of Italy, head straight to Calabria, also known as the toe of bootland Italy. With its inevitable charm, Calabria is proud to have kept its natural beauty intact, untouched by the modernization and development spree that is commonly apparent in other parts of Italy. It won’t be wrong to dub Calabria as a nature’s paradise, with its majestic scenic beauty and alluring naturescape. Surrounded on three sides by water, Calabria is well-known for its serene sandy beaches, turquoise waters, sandy cliffs, rustic headlands, and incredible mountain ranges. The sunny, isolated, and uncrowded Calabrian beaches are idyllic sights for a romantic retreat with your beloved, offering great avenues for sunbathing and adventure activities. Calabria’s mountainous landscape makes it an idyllic base for hiking and trekking. The pretty coastal town of Tropea is an ideal base for those looking for a perfect sun, sea, and sand experience, with its extensive sandy beaches and panoramic views over the Tyrrhenian Sea. If you are lucky enough, you can even have a glimpse of Mt Stromboli on a clear day from here. Grotticelle and Tonicello beaches in Capo Vaticano are large enough to offer you private space with your beloved even during the peak season. For a diver, Costa Bella or the Coast of the Gods offers to be the most fantastic diving spot in Calabria to unravel the unique beauty of the local flora and fauna. The Tyrrhenian coast is known for beautiful views of the ìBellaî and Aeolian Islands, with its crystal clear sea, white sandy beaches, and prolific seabed with marvelous forms of life. The mesmerizing Orange Coast is characterized with its sand and shingle beaches, rocky headlands of white granite and a vast stretch of coastline that offers plenty of adventure opportunities. Calabria has been the guardian of its rich legacy, which is clearly apparent in its architectural landmarks and historical sites that take you back in history. The remnants of the various civilizations that inhabited this incredibly mountainous terrain are clearly visible here in the mosaic baths, bridges, monuments, and structures dotting the landscape. For a perfect historic destination Calabria tops the list of places to explore in Italy. 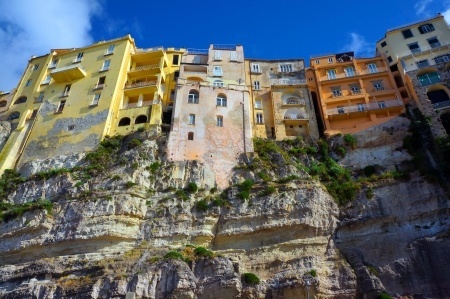 Gerace, Tropea, and Civita are home to the most important hisotrical landmarks in Calabria, with Tropea being the historic center, Gerace housing interesting 13th century churches, and Civita being the proud bearer of Albanian heritage of the region. The Cattolica Monastery in Stilo is a must-see destination for somebody in love with history. Dating back to the 10th century, this tiny red-brick church is a testament to Stilo's past and its connection with Greece and the Ottoman Empire. There are numerous Byzantine-era sites that have survived to date in Calabria. The famous San Giovanni Teresti in Bivongi and Santa Maria del Pathirion still stand like a rock as a testament to the historical legacy of the region. Squillace is another important archeological site and a popular beach town on the Ionian Sea. Aragonese Castle in Reggio Calabria is particularly famous for its two cylindrical towers and watch tower. Nearby is the splendid Cathedral of Reggio Calabria, built in Baroque style with a beautiful facade. The walls of the church are completely decked in multi-colored marble. The Calabrian Arts Center houses a spectacular range of Roghudi blankets, woolen and silk shawls, Gerace and Bisignano pottery, Longobucco covers, tapestries, baskets, wooden sculptures, iron and glass ornaments, and pastoral art objects. If you are curious to see how the colorful Seminara masks that have the power to ward off evil spirits look like, this is the perfect sight to be in. You can even purchase these magical masks. The Archaeological Park of Scolacium bears the remnants of an ancient Roman colony and houses the monumental 11th century Basilica of Santa Maria della Roccella – considered one of the largest churches in the region. Whether you are on a historical tour or seek a beach destination Calabria offers you both. You could spend an entire vacation hopping from one beach to another in Calabria, exploring the natural and historical legacy of the region, and still not get bored. The Bergamotto city of Reggio di Calabria boasts an impressive seafront promenade, overlooking the Tyrrhenian and Ionian Seas. Learn more about Lamezia Terme, a beautiful town in the toe of Italy, Calabria.